Taking care of a violin can save you hundreds, if not thousands, of dollars throughout the life of your instrument. Removing scratches from your violin is a time-sensitive matter. Allowing any scratch to remain exposed, no matter how minor, exposes the instrument to harmful moisture sensitivity. According to the University of Pennsylvania, the owner of an expensive violin who neglects proper care may ultimately cost himself between $1,000 and $50,000 in total repairs. Without question, when a violin get scratched, it's time to go to work. Touch the case of the violin. Wait a minimum of 15 minutes to open your violin case if it's cold. Waiting allows the case -- and the violin within -- to naturally warm to a suitable temperature for proper repairing. Place the violin case in an area away from direct sunlight before opening. Work in an environment with low humidity and a steady 70- to 75-degree -- or moderate -- temperature. Remove the violin carefully from its case. 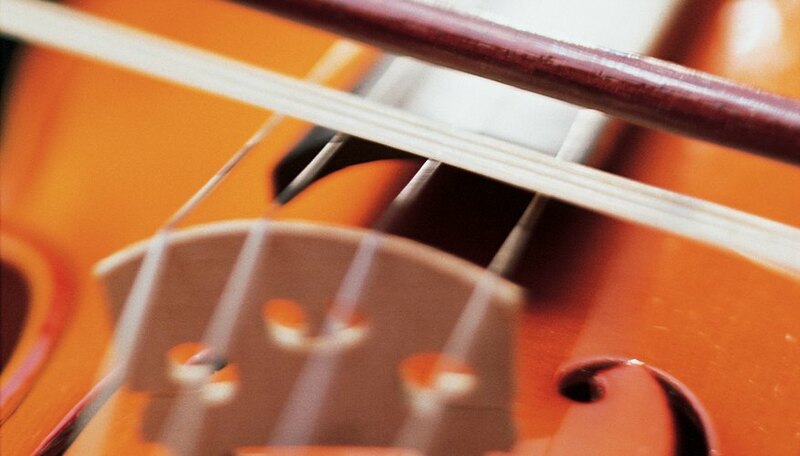 Place the violin on a soft cotton cloth. Keep the instrument away from all hard surfaces to prevent the possibility of additional scratching or chipping. Wipe any existing dust or dirt from the scratched area with a second soft cotton cloth. Wipe slowly, with low to medium pressure, in the direction of the wood grain. Coat the scratched area with violin varnish using a synthetic fiber brush. Brush the scratched area in the direction of the wood grain. Allow 30 minutes to one hour for the varnish to fully dry. Repeat the varnish application process one or two additional times before moving on. Buy violin varnish at your local music shop. Employ high-quality varnish to avoid any possible discoloration. Coat the area with varnish cleaner using a second synthetic fiber brush. Brush the scratched area in the direction of the wood grain. Allow 30 minutes to one hour for the varnish to fully dry. Purchase high-quality violin varnish at your local music shop.